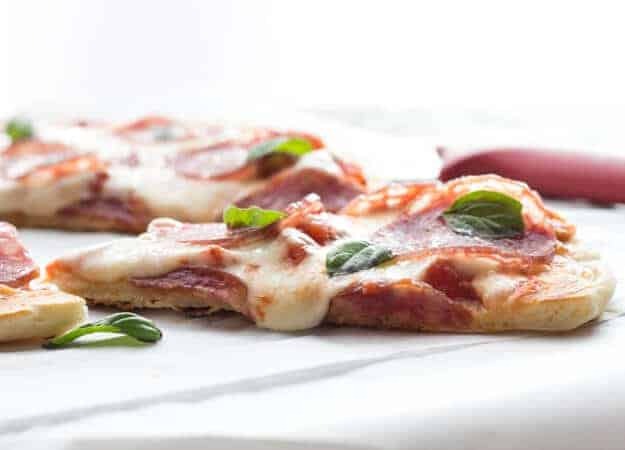 Homemade Stove Top Pizza Calzone, fast easy and the perfect way to make pizza especially in the Summer, add your favorite toppings to make this your new amazingly delicious cheesy pizza. You read that right! 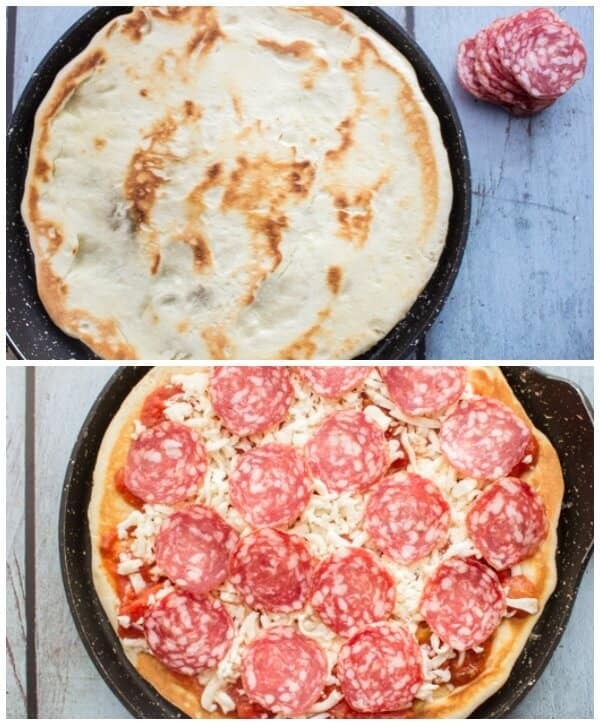 Stove Top Pizza. What can I say, we love Pizza. During the cooler months we usually have pizza either Friday or Saturday night. But with this heat, I dread the thought of turning on the oven. So my youngest daughter who can never live without it or Nutella told me of this amazing discovery she made. No oven needed, seriously Homemade Stove Top Pizza that tastes amazing she said. Yeah right I thought, so after convincing me with some serious googling, I went to work. I used my Best Pizza Dough and some garden fresh veggies, basil included. All I can say is whoever invented this was a genius. And yes it has been around for quite some time, apparently! So how did I miss this? Sometimes I think I live in outer space. I made up my pizza dough, let it sit and double in bulk for about an hour. 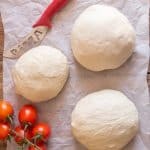 The amount of the dough is enough for 3 thick crust 9 1/2 inch (24 centimeter) Pizzas (if you prefer thinner crust then use less dough). I actually did it two different ways, the first way I placed a third of the dough in the bottom of a lightly greased heavy-duty frying pan (cast iron works great) and topped it with all my pizza ingredients, I even included some leftover mushrooms from lunch. I covered it and let it go on medium heat for approximately 15 minutes. I uncovered it a sliver and let it go on low heat for another 15 minutes. It was cooked but a little light in colour on the top and yes the Italian said “not cooked enough”. It was almost like Goldilocks. The second and third ones I browned the dough for about 10 minutes, flipped it over, topped it with the toppings, covered it and let it finish cooking for approximately 15-20 minutes. If you like a darker crust cook it a little longer, just remember don’t go higher than a low/medium heat. 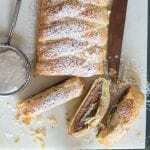 Then I started thinking, what about Calzone, yep it works too! 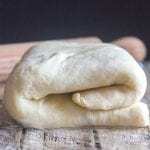 Just cover half the dough with toppings, fold the other half over, pinch the sides closed so none of the filling escapes, cook covered 15-20 minutes on each side. 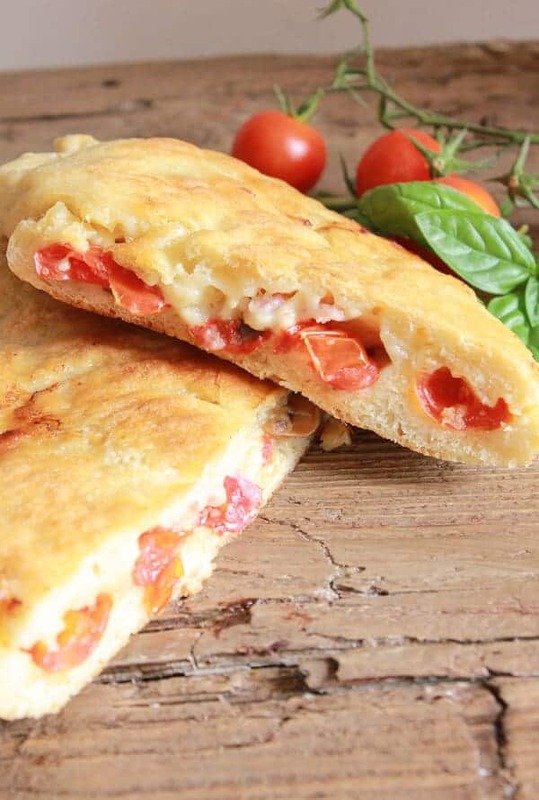 Perfect Homemade Stove Top Pizza Calzone, so if you are like me and this is a novelty for you too, trust me on this, great, delicious, fast and a great summer dinner alternative. Buon Appetito! 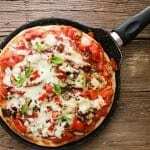 Homemade Stove top Pizza Calzone, no need to heat the house with this fast, easy and delicious summertime Italian pizza and calzone recipe. *I sautéed the mushrooms and chopped peppers with a little olive oil, oregano, salt parsley and a little water, cook on medium heat until water has evaporated and mushrooms and peppers are lightly browned. In a small bowl toss together the chopped tomatoes, salt, oregano, chopped basil leaves and olive oil. Set aside. Line the bottom of the pan with 1/3 (or less) of the dough. Heat on low - medium heat covered for approximately 10 minutes until the bottom is lightly browned. Flip it over. On the browned side add the tomato mixture, pancetta, mushrooms and mozzarella. Cover and continue to cook on low to low/medium (more low then medium) heat for another 15 minutes. Uncover lower heat and continue for approximately 5 minutes. Check it after 10 minutes making sure it doesn't burn. Line the bottom of the pan with dough, cover half the dough with the tomato mixture, pancetta, mushrooms, mozzarella and Parmesan, fold the other half over, pinch the sides closed so none of the filling escapes, cook covered on medium heat 15-20 minutes on each side. Serve immediately. Enjoy! **Check your heat, remember not too high or it will just burn and not cook completely. **Calories are just for the topping. Hi Keren, thanks so much, so glad you enjoyed the Pizza. My daughter loves it too. Have a great weekend. I’ve reheated leftover pizza on the stovetop but never thought of making from scratch, sounds brilliant. Hi Clare, the only cake I know that is made with that many eggs would be a sponge cake (my mother-in-law’s recipe and that would be the cake I use to make my Tiramisu Layer Cake). 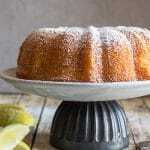 And it sounds like she just filled it with Pastry Cream (which the recipe is also on the blog). Hope that helps, let me know. I have a question this will be my first time trying out this recipe I’m staying at a hotel this weekend with my kids and thought this might be a fun dinner to make together and try out. The hotel we’re going to stay at has a stovetop but not an oven so when i saw the recipe for stovetop pizza it caught my attention. My question is do i need an oven to make the pizza dough? 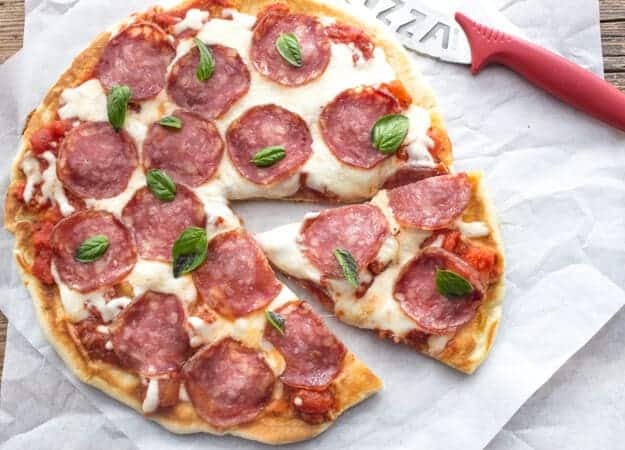 Its no big deal if i do im just wondering if i need to make the pizza dough tonight so its ready for tomorrow night or can i make it without an oven? Hi Candace, no you don’t need an oven to make pizza dough and you could always use store bought pizza dough too, to make it even quicker. Hope that helps. Have fun and let me know how it goes. Hi Susan, no problem, whenever you have a question feel free to ask. 🙂 Have a wonderful Sunday. You mentioned that you covered it during the first cooking phase. Covered with what? What a cool idea! I had no idea pizza could be made on the stovetop! Hi Liz, I know it’s a great idea. Especially in the summer. 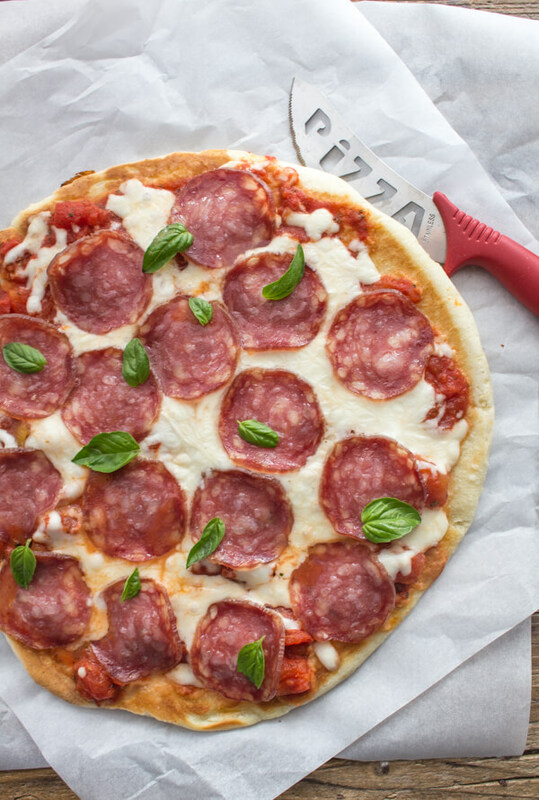 Homemade pizza is a family favourite but we’ve never tried cooking it on the stove, great idea! Hi John, turned out really good, hope you give it try, have a great weekend! Yum! That looks delicious. I need to try this out with gluten free flour. I’ve never tried this on the stovetop before either, but it looks like fun! What a great idea for summer months for someone that doesn’t have a grill (which I don’t). I’ve seen cast-iron skillet pizzas floating around the internet, but I’ve never tried it before. I’ve made your pizza dough, so I know it’s a winner in the oven – totally makes sense that it would work on the stovetop, too. Hope you’re staying cool! Hi April, it’s amazing how good is. Thanks, glad you enjoy the pizza dough. Not that bad today, but who know tomorrow? 🙂 Have a great weekend. You had my heart fluttering with pizza!! It’s like a big yeasty pancake with delicious toppings or fillings. Great recipe Rose!! Have a great weekend. Hi Marisa, thanks, can’t get much better then pizza! Have a great weekend. OMG! 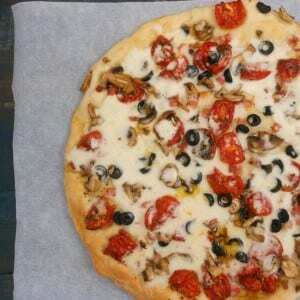 Pizza–my favorite all time food—everybody’s favorite food! Your pictures are so clear and beautiful, I feel like I could just reach up to the screen and take a piece. And the calzone! Wonderful anytime. You are a great cook, Rose. I know I say this often, but REALLY—you need to write a cookbook. Love your recipes………..
Hi Diane, thanks so much, I love Pizza too, with anything on it! Have a wonderful weekend.